On March 5th of this year, Albert Maysles, documentary filmmaker and one half of the famed Maysles brothers, passed away. Along with his brother David (who died in 1987), Albert directed such groundbreaking films as Gimme Shelter, Salesman, and one of my favorite docs, 1975’s Grey Gardens, the story of a high society mother and daughter who spent their final years together living in squalor. Edith ‘Big Edie’ Bouvier Beale and her daughter Edith ‘Little Edie’ Beale were members of the distinguished Bouvier family, which made them the aunt and cousin, respectively, of former First Lady Jacqueline Kennedy. In their earlier years, both women lived a life of privilege, residing in a luxurious East Hampton beach house known as ‘Grey Gardens’ (named as such because of the nearby sand dunes) and attending all the best parties. That began to change, however, when Big Edie’s husband, attorney Phelan Beale, left her for a younger woman. As a condition of their separation and eventual divorce, Big Edie was given Grey Gardens, where she and daughter Little Edie lived for the next 50 years. The two made national headlines in 1971 when, during an inspection of the property, the Suffolk County Health Dept. found Grey Gardens in a state of disrepair, with rats and raccoons living throughout and gaping holes in the walls and floor. When they threatened to condemn the property, Jacqueline Kennedy and several other relatives chipped in to fix Grey Gardens up, thus saving it from the wrecking ball. By the time filmmakers David and Albert Maysles hit the scene a few years later, the house was once again in very bad shape (along with the raccoons, dozens of stray cats had moved in, and garbage was piling up everywhere). In spite of all this, Big and Little Edie welcomed the Maysles with open arms, giving them access to every facet of their lives. The resulting film, Grey Gardens, was instantly heralded as a classic, and in 2014 tied for 9th on Sight and Sound’s list of the 10 Best Documentaries of All-Time. 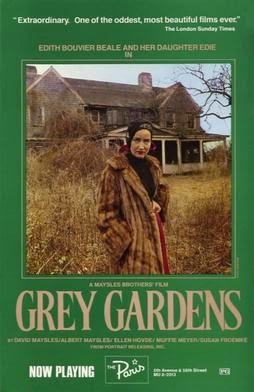 Grey Gardens is, indeed, a fascinating motion picture, and it owes much of its success to its main subjects, who, despite the horrible conditions in which they lived, clearly believed they were still members of New York’s societal Upper Crust. In addition, both fancied themselves singers, and performed for the camera every chance they got (Little Edie even staged a few dance routines). More than this, though, it’s the acerbic relationship between the two women that draws your attention, with each taking a dig at the other in just about every scene. Barely a moment goes by without Little Edie lamenting the fact she’s spent her best years looking after her mother, saying at one point she’d prefer a tiny apartment in New York City to the spacious Grey Gardens. As for Big Edie, she seldom gets out of bed, and clearly doesn’t like it when her daughter leads the Maysles into another area of the house (the moment Little Edie is out of her sight, Big Edie starts calling for her). The two bicker constantly about music and their memories of the past, and things finally come to a head in a late scene, with Big Edie lashing out because her daughter won’t stop singing, and Little Edie bursting into tears, accusing her mother of chasing her suitors away. Without a doubt, Big and Little Edie are among the most eccentric personalities ever to grace a documentary film, and Grey Gardens shows them in all their warped glory.